Home Costs > How Much Does Mudjacking Cost? Mudjacking, also referred to as slab jacking, is a technique used to stabilize settling foundations and/or repair crumbling concrete surfaces such as a sidewalk or driveway. The cost of mudjacking will depend on the condition of the surface, the size, where you live and who you hire. In most cases, a typical residential job will cost about $500 to $1,000. Generally, your contractor will charge by the square foot and can come to your home to offer a free estimate. In most cases, be prepared to $4 to $7 per square foot, with companies charging a minimum job fee, which is usually around $150 to $250, depending on how far you’re away from their location. Even though most quotes will be straightforward, it doesn’t hurt to get at least three to five quotes before making a decision. This is where a free service like HomeAdvisor.com can help. Here, you can simply explain your job and HomeAdvisor.com will match you with multiple contractor quotes in your area for free. Angie’s List talked with a professional contractor, who claimed it would cost about $300 to $700 for most jobs. The contractor advises choosing a professional with a lot of experience and integrity. During the process, contractors will drill two to five-inch holes into the concrete and will then pump a “slurry,” which consists of water, dirt and cement, into the holes, eventually raising the concrete to a leveled surface. When raised, the holes are then filled with concrete. Most jobs, if done by a qualified contractor, will take about one to three hours to finish; however, if it were a larger job, then it could take the entire day. After the job is complete, you may have to wait six hours before you can drive on it. In some cases, mudjacking won’t level your concrete and more extensive repairs may be required. 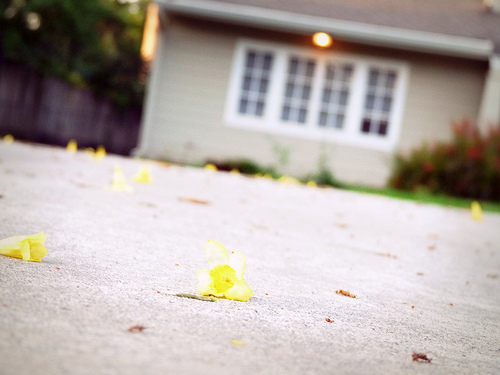 For example, if your concrete has cracked into tiny pieces, mudjacking may not improve the appearance. The same can be said about using it on certain parts of your foundation due to the thickness of the mud preventing it from getting into every crack. If any repairs were needed outside of the typical mudjacking job, then additional repairs could be required such as replacing the concrete in its entirety. All concrete surfaces can be mudjacked, including sidewalks, steps, patios, pools, garage floors, driveways, grain bins, streets, parking lots, loading docks and warehouse floors. New cracks can show as your slabs are being lifted into place. This is due to the stress cracks on the bottom that are not visible to the naked eye, but as the pressure releases, the crack will show near the top. The newer holes, even though they are small, won’t match the color of your existing concrete because the newer concrete will be lighter than the original concrete colors. Over time, however, these patches will darken as it ages. The process, as long as done properly, can last many years, sometimes even decades. However, if the ground wasn’t 100 percent compacted and the soil continues to wash beneath, then the soil can wash out, causing the concrete to sink yet again. A building permit will not be required to complete this job. Mudjacking is actually already a money saver since it’s up to 75 percent cheaper than replacing your concrete.